Cruise itineraries take you to some of the most fascinating places in the world. You may capture destinations with magnificent glaciers or behold white, pristine sandy beaches. Wherever your cruise takes you, you’ll want to make sure that your time in port is just as exciting and/or relaxing as it is on board ship. Shore excursions are just as important to your vacation itinerary as choosing the cruise line itself! So, when and where should I book my shore excursions? I’m glad you asked! If there is an activity that may cause regret if you missed it, then book the excursion right away to ensure a spot! Otherwise, take a little time to do some research and see what activity best fits your interests. If you want to book with a company when you arrive at the port, make sure you book a guide before leaving security, not after! No matter who you book your shore excursions through (cruise line, third party company, or on your own at port) there will be benefits and disadvantages. 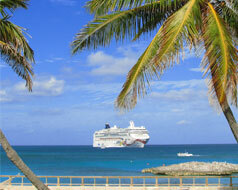 A cruise line can be very expensive, but they offer high quality excursions that are convenient. Plus, if you are late, the ship will wait for you. If you book with a third-party company and you return late, they will get you back to the ship at the next port. Finally, going completely on your own may be light on the wallet, but not all tours accept credit cards and the quality may be less than satisfactory. Because it is an “on your own” activity, if you miss the ship, you are on your own. For more information, check out: 3 Ways to Purchase Shore Excursions. You don’t need a lot when leaving the cruise ship to go explore each new port, but make sure you have these! Cash – There may be many places, including small tourist shops, that do not accept credit cards. Cash also comes in handy when tipping your tour guide or taxi driver. Small backpack – Anything for water bottles to little goodies to keep you hydrated and happy is always a good idea. And what better place to put them all than in a small backpack! If you purchase a souvenir or would like to want to bring a long your sunglasses or a jacket, a backpack keeps everything together in a convenient and safe way. Don’t bring anything that you don’t want stolen or left behind! Watch – Your time in port is extremely valuable. While many people use their phone to check the time, a watch (don’t wear an expensive watch) is a lifesaver so you don’t have to pull out your phone every hour. Keeping track of time will not only help you know how much time you have throughout each port day, but it will also help you avoid being left behind when the cruise is ready to depart.